Having landed in New York it was onto the cargo depot at JFK to collect the bikes. Taking your own bike into the States isn’t as complicated as it initially sounds and certainly works out cheaper than renting one for a similar length of time. 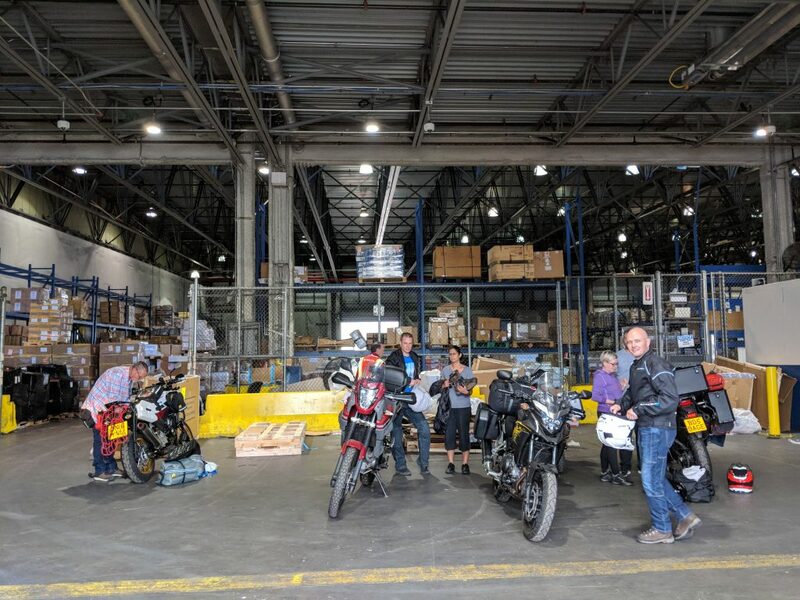 The places had been sold, people had booked their flights, bought their gear and got excited about the prospect of riding from New York to Los Angeles on bikes that were to be shipped in from England. It was going 3.5 weeks of riding some of the best roads in America. Fifteen riders in total were signed up for it, the paperwork all done with about three months before we were due fly out and meet the bikes. That’s when the GDPR rules were introduced, stipulating the way in which companies manage and dispose of their customers information. It mainly applied to operations within the EU, but it also meant that any external company doing business with EU citizens still had to comply with the legislation. Rather than comply, the American insurance company that usually provides fully comprehensive policies for riders of foreign bikes – Dairyland – suddenly pulled the plug on it, citing GDPR as the reason. It meant that none of the bikes could be insured to be ridden in the US. It affected everyone. Other tour companies, private individuals. Everyone was desperate for a solution but one just didn’t come through. Other trips were cancelled, we missed the deadline for shipping the bikes there by boat. At the eleventh hour we found a Mexican broker called Seguro Gringo – maybe the dodgiest name in all of Mexico – who could insure us third party only for the minimum legal allowance in each state we passed through. For passing through litigiousness America, it was far from ideal. Four riders pulled out due to the uncertainty, leaving the eleven who finally boarded the plane. We had Garry, a Ford technician from the South East, Adrian, a BMW R1200GS riding podiatrist from Bromsgrove, Mark and Dave, a couple of brothers from just outside Liverpool, one a carer for his wife, the other a van driver. Then there was David Martin who’d previously ridden with me from Land’s End to John o’Groats after being declared fit from bowel cancer. Cancer was now back but he was going anyway, with a break in chemo to give him the window of opportunity. Peter the retiree had wanted to ride across the USA for quite some time and this was now deemed his chance. Keefe had just sold his business so time and opportunity was now on his side, whilst Simon worked for himself and took time away from surveying to make the trip along with his wife Siobhan on the back. That just left James (crane mechanic) and Paul (international man of mystery) to make up the posse. After a shaky start, Garbage Run USA was go. Dave, Mark, Garry, James and Keefe in Central Square on the eve of hitting the road. We’d landed on the Saturday, collected the bikes the Monday morning and was on the road that afternoon. We landed in New York, Saturday 18th August. It was hot, summer, humid as well. We all stayed in a YMCA hostel to the west of Central Park. Many of the guys hadn’t been to America before so it was a day of sight-seeing before we could collect the bikes from the airport on the Monday. 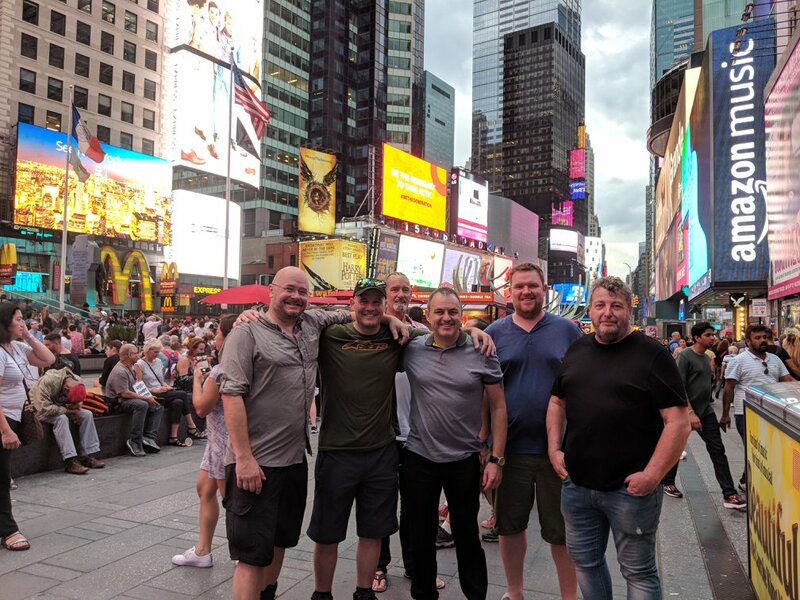 We did the usual sights of Times Square, some headed off to see the Empire State Building and the Statue of Liberty. We bought all the bits and pieces we’d forgotten, ready for the Monday morning when we’d catch a minibus out to JFK airport where hopefully our bikes would be there and waiting. I’d shipped bikes into the USA twice before this trip. 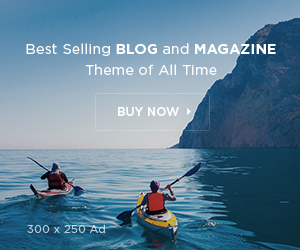 It’s not hard, especially using a reputable shipping company such as James Cargo, Motofreight or Shippio. 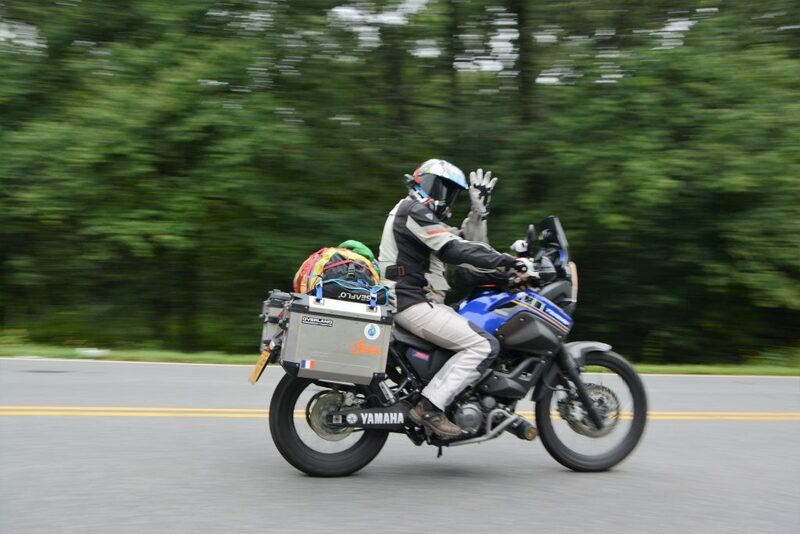 They take a lot of leg work out of it, with the tradition being to fly the bike into the USA, but boat it back at the end in order to save some money. Once the bikes land at the airport you go to the cargo terminal of the airline they flew with, most commonly Virgin Atlantic. All bikes travel in their own wooden crate, well strapped down and laden with all your gear for the trip. To free them from the cargo company you first have to go to the cargo terminal to collect some paperwork, then across to the other side of the airport to see Customs who will stamp and approve your paperwork. Back then you go to the cargo company and finally you’re presented with your box with the bike in it. Borrow a crow-bar and away you go. 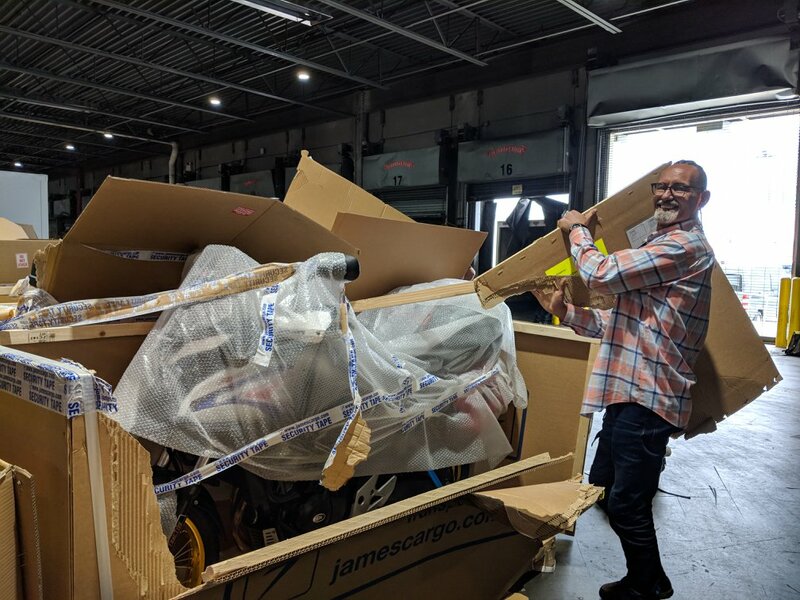 Peter unpacking his Honda CB500X with Rally Raid kit at the JFK cargo terminal. The guys in the cargo depot were kind enough to lend us tools and at the end dispose of the wooden pallets. As the person organising the trip it was a bit nerve wracking this day of getting the bikes out of the airport. So much to go wrong. Bikes held by customs, bikes missing, bikes damaged, bikes not arrived yet. 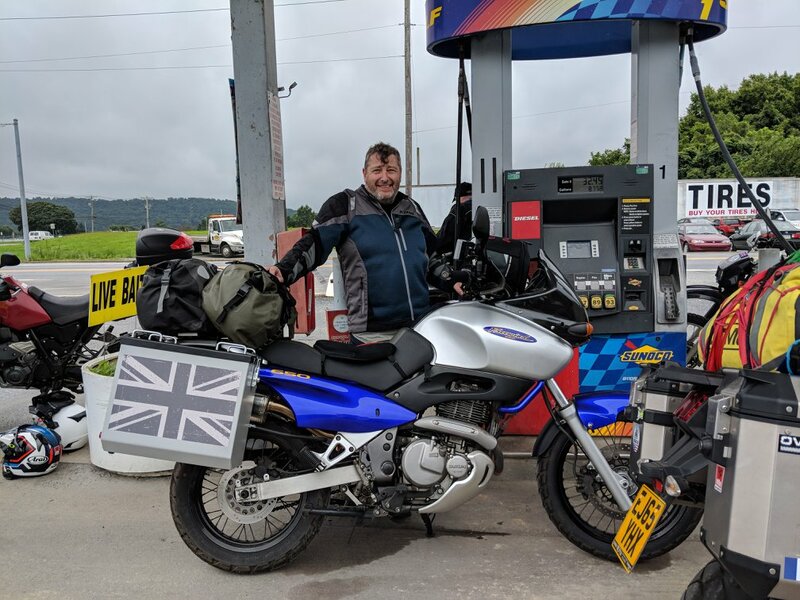 So much then rested on the bikes being obtained easily and quickly, with the plan being to get them that morning then hit the road straight away, riding due west, in in order to make the first night’s stop some 190 miles away. It took about 3 hours in the end to free the bikes and the moment you’re given the green light to go is like Christmas morning, everyone levering and pulling at plywood in order to get to their machines. Bikes unloaded and rolled out of the crate we all stood in the carpark of a busy cargo terminal at JFK. About 3000 miles to the West was LA. And that, by means of a twisting and winding route was where we were heading. The plan was rough. 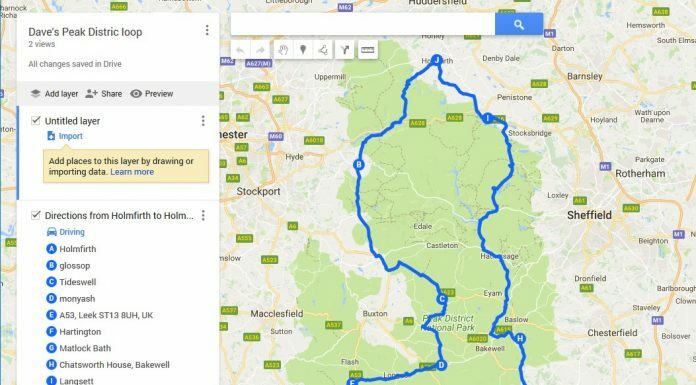 We had the first few nights accommodation sorted and from there we would make it up as went, judging how far we fancied riding and which exact route we would take. WhatsApp is a great app for keeping everyone together and in communication. As with all the trips I run; UK and overseas, I encourage people to ride at their own pace and even take their own route. It’s about encouraging people to gain confidence to do it themselves, not obediently follow me as the guide from beginning to end. The plan was to camp for much of it, but if some wanted to stay in hotels and motels then they were welcome to. 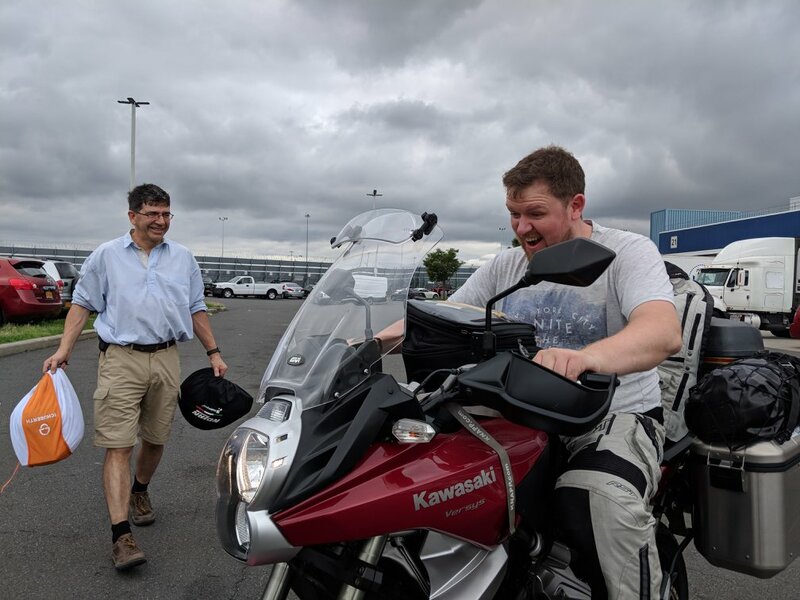 James excited to see his Versys 650 again, whilst Adrian cuts a stylish figure as he prepares to ready his BMW R1200 GS for the trip ahead. 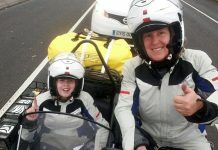 Adrian would pick up is pillion passenger and partner Maria out in Texas. Riding out of New York was probably the hardest part of the trip. Busy highways, lots of traffic and from JFK you’ve got a lot of turns to make before you get west of the city and out onto clearer roads. We were heading for a AirBnB I’d booked for us all that evening – the Hobby House Retreat – nestled just over the border into Pennsylvania – deep in the heart of Amish country. It was a big old house with shared rooms and a big space outside for working on the bikes and dealing with any niggles that evening. It’s always hard to know what to take and how to pack on a trip like this. You never get it right first time and so having a base that first evening to faff around with best ways of packing and strapping would be ideal. Obviously we’d all over-packed to some extent, but it’s completely natural on a trip like this and you find as you go along you gradually whittle it down to the things that you need. As for the bikes we had a right mix of machinery. 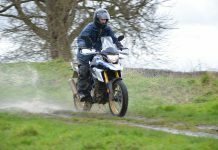 Paul, Peter and Mark were all on Honda CB500Xs, Peter’s with the Rally Raid upgrade kit. Keefe was on a 20-year old Suzuki XF650 Freewind, Dave on a slightly newer Kawasaki KLR 650, Garry and Dave Martin both on Yamaha Tenere 660s, Adrian on a R1200 GS – handy for he was being joined by his partner Maria out around Texas way – whilst Simon and Siobhan were on a Honda Africa Twin. I was on the slowest bike of the lot; a Royal Enfield Himalayan, which is why the plan was to avoid the interstate as much as possible. Only that day out of New York did we ride it begrudgingly; crossing the Hudson River, out past Manhattan and then out along the I78 and into Pennsylvania. Having 11 bikes behind you is a stressful time. The worry of something going wrong, people having breakdowns or accidents, or simply not enjoying it. But I knew from crossing the USA twice before that it’s hard not to have a good ride out here. There are parts that are less exciting. The bit through the middle is bland, and first day out of New York and the last day into Los Angeles would be hectic, but everything else, from the Appalachian Mountains in the East to the Mid-West of Utah, Arizona, New Mexico and Colorado in the West would more than make up for it. We arrived at the Hobby House that first night tired but happy. Owners Aimee and her husband Curt had made us a home cooked dinner; chicken and potatoes, with a dessert and cookies for after. Just what we needed, the chance to unwind at this big white wooden house deep in the Pennsylvanian countryside. The first night having ridden out of New York we stayed at the Hobby House Retreat, a place found on Air B&B and perfect for giving us a place to unpack and repack and have a nice home-cooked dinner cooke by host Aimee. The Appalachian Mountains are an endless stretch of mountains beginning just to the west of Washington and arcing down like a crescent moon, through Virginia and North Carolina. The Skyline Drive and then the Blue Ridge Parkway are recreational roads built right along the crest of the mountains, taking you a total of over 600 miles without having to pass through a town or city. The road is a gift to the people of America and its visitors to enjoy the mountains of the Appalachia with none of the hindrance that usually comes with a Trans-America road trip. I’d ridden it once before in the autumn when the leaves had turned to orange and gold. Mid-August then would still be in full bloom, and the traffic actually calmer that it is in the autumn. From the Hobby House we headed down to Gettysburg, stopping at a Walmart to pick up some supplies, before tracing a non-interstate route from Frederick to Harpers Ferry and onto the mountain town of Front Royal where the Skyline Drive began. It wasn’t a great day of riding this second day. It was just a question of getting there and keeping dry as we did have a spot of rain that day. Riding in America isn’t that tricky, not after the first few miles. Drivers are usually predictable and courteous. Stop signs are something it takes us Brits a while to get used to, as does being able to turn right on a red traffic light. Speeds are sensible, with it only on the interstates that the trucks over there blow past you at over and above 80mph. The lady with the hardest task was Krina, Dave Martin’s partner, who, given his break in chemo to come on the trip, had decided to fly out, rent a car and shadow us just in case he had problems. She barely drove in Britain, and now was tasked with steering a big 4×4 rental car all the way across America. If anyone deserved a medal, she did. 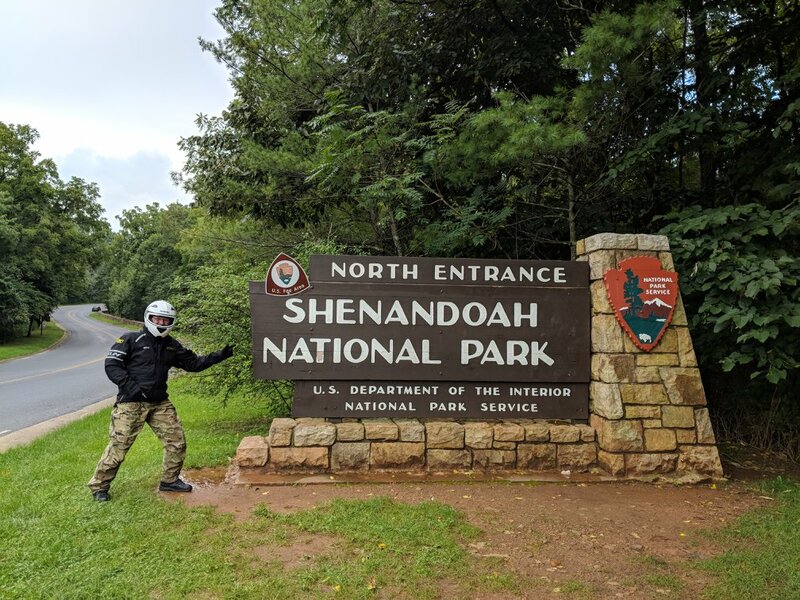 Dave posing with the sign at the start of the Skyline Drive, which then in turn led onto the Blue Ridge Parkway, all up providing around 700 miles of uninterrupted riding along the ridge of the Appalachian Mountains. Tiredness kicked in towards the end of this second day. 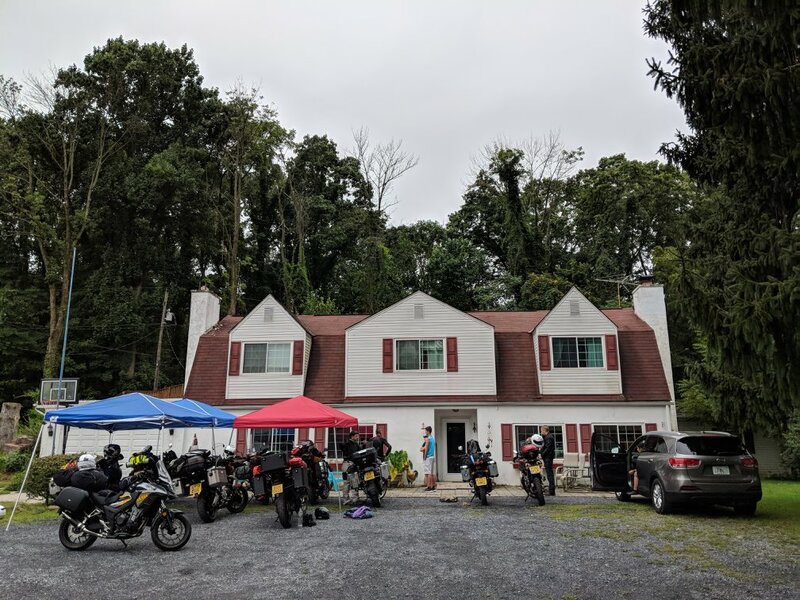 Some took the direct route to our second nights accommodation; invited to stay with a British couple living just off the Skyline Drive. Linda and Charlie had travelled many places on bikes and were prone to inviting passing travellers to stay over. Linda had messaged me on Facebook and said we were welcome to drop by, so we did, turning off the Skyline Drive and along the back roads until we pulled up a muddy driveway to a house with a wonderful view of the smokey valley below. There we had waiting a dinner to feed an army, a fire burning by the veranda, cold beers and the offer to stay in the cabins they rented out in the woods. By cabins I mean luxury cabins. The guys couldn’t believe their luck. Some had Jacuzzis and the most amazing views. It was just what we needed. We couldn’t thank Linda and Charlie enough. Dave woke the next morning not feeling well. His treatment and his jet-lag combined to make him tired and weary. There was talk of disassembling his bike and putting it in the back of Krina’s rental car. There was fear that if that happened it would never get taken out and ridden again, so instead Dave and Krina decided to stay at Charlie and Linda’s house and re-coup for a few days; aiming to catch us up a little further down the road. Hand on heart, I thought that was the end of Dave’s riding for the trip. I never thought he’d catch us up. 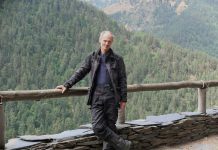 I never thought he’d get back on the bike and would instead complete the journey by car with Krina. Which would still have been a fantastic trip in itself. We left them that morning with a sense of foreboding. I felt for Dave, but I needn’t have worried, the man’s as tough as a brick. 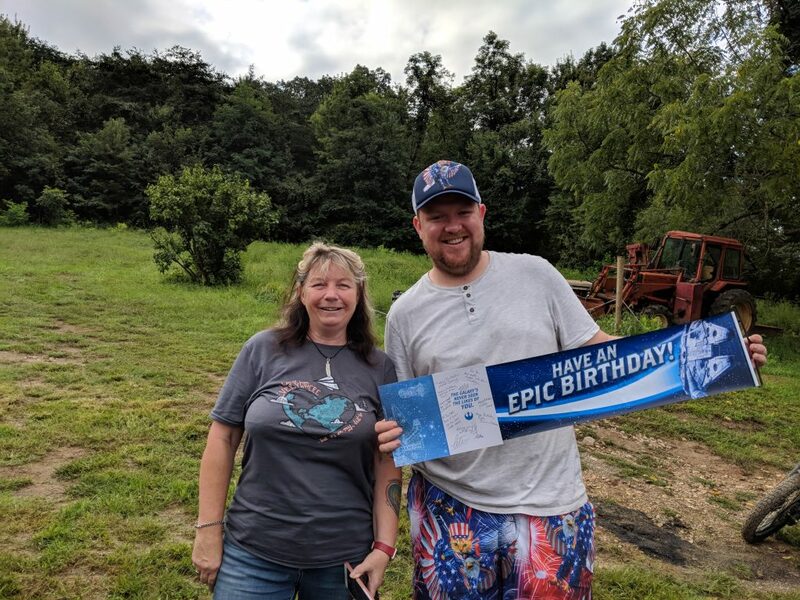 Birthday boy James with host on the second night, Linda, who very kindly put us all up in the cabins she rented out in the woods. A perfect place for people to unwind. We rode Sykline Drive in the rain. A winding serpentine stretch of road with a 40mph limit but that’s okay as there’s so much scenery to take in and corners to negotiate. The beauty was that no one could get lost. Just keep following it until we reached the town of Waynesboro, where you exit Skyline Drive, cross a bridge, and immediately begin the 500 miles of the Blue Ridge Parkway. By this point we’d bought annual National Park passes for about £60, which gets you into all the national parks between here and LA. It saved us a fortune getting those. We were aiming for Meadows of Dan this third day, a small hamlet just off the Blue Ridge Parkway with a motorcycle friendly campsite called Willsville. It would have been a perfect place to stay but we didn’t quite make it. It’s always hard to predict exactly how far you’ll get and how far you’ll feel like riding in a day. This was the whole point of not over-planning it and allowing the trip to become its own. That’s not so hard in America as it’s such an easy country to travel. A plentiful supply of motels, campsites, fuel stations and diners mean that you’re never that far from one amenity or another. Even with 12 bikes and riders it was still possible to wing it, as nerve-inducing that is to begin with. In a way I was glad the other four had pulled out, as 15 bikes would have been too many. Instead of Meadows of Dan, we stayed that night in the city of Roanoke, a place we still don’t know how to pronounce. We found a motel through trail and error. There were some that were a bit grotty, but another was half decent, and for a reasonable price. Even with a dozen riders on the doorstep they had plenty of available rooms. Washed and changed, people walked into the city, discovering a very pleasant down-town area. Misconceptions about America being unsafe, especially in the cities, seemed untrue here. It had a rustic old down-town, lots of bars and restaurants. It had a good feel to it, ending up in a bar with its own brewery, serving magnificent beef burgers, a thing that you soon realise is quite common in America. Some great burgers to be had over there. It felt as though we lived on them at times. And often we did. 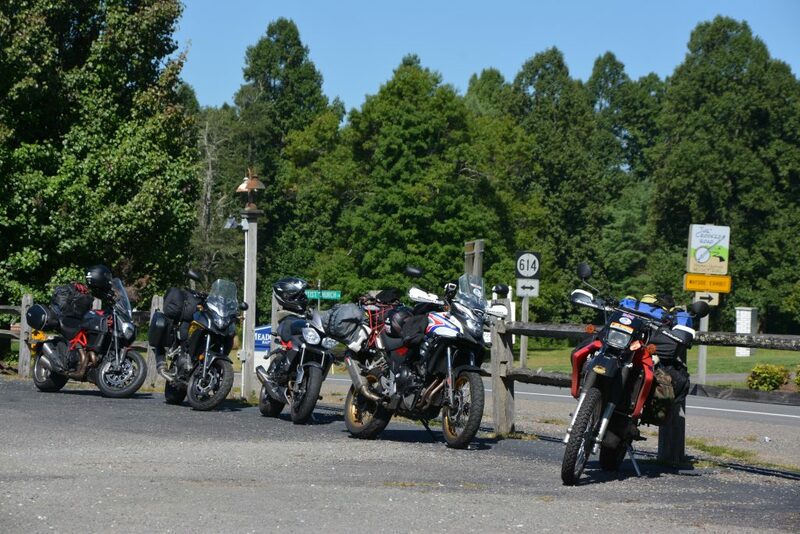 The bikes all lined up outside a diner in the small town of Meadows of Dan, just off the Blue Ridge Parkway. We’d intended on staying at Willsville, the bike campsite nearby, but had stopped short the day before, booking into a motel in Raonoke instead. We passed Meadows of Dan the next morning, having breakfast in one of the diners by the gas station. A few of us had biscuits and gravy; an American tradition, basically consisting of a couple of big scones and some chicken flavoured gravy over the top of it. It was a plate full and hard to eat it all. 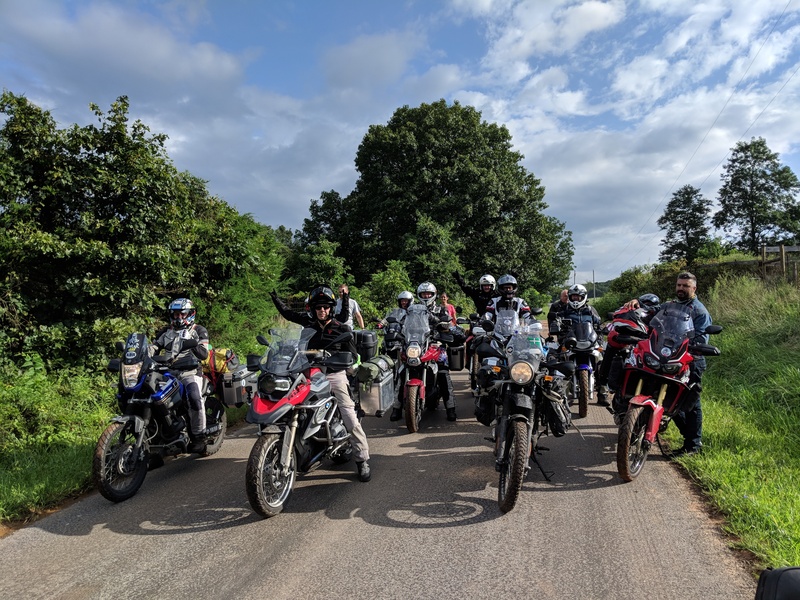 More than anything it was just the sense of being on the road; this big group of UK bikers being blown across the USA, finding their feet, feeling more confident, letting themselves relax into the flow of motorcycle travel. It was challenging for me. So much unknown and uncertain about the trip, the intention being to leave it to chance, which is fine when you’re riding solo, but with a big group it’s a nerve-wracking feet for a while. You just want everyone to be safe, and have a good time. You stop riding for yourself and just worry about everyone else. We camped again that night, this time at Linville Falls on a State park campsite costing about $5 each for the night. We ate at a local diner. We were quickly piling on the pounds. More of the Blue Ridge Parkway followed. Sometimes it can get repetitive, seeing the same mountain scenery mile after mile, but then around the corner the same scenery takes your breath away, this blanket of trees with a blue hue in the air, giving it the nickname the Smokey Mountains. 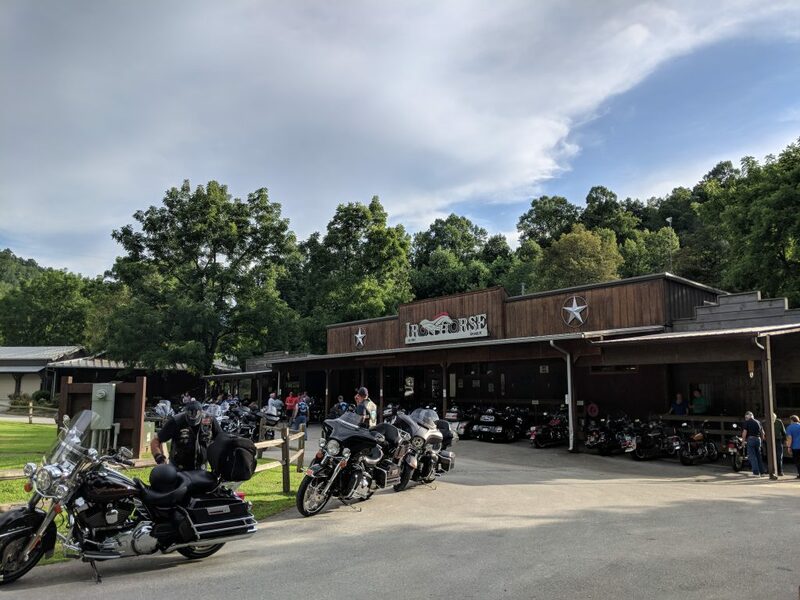 After three days of riding we eventually arrived at the end of it, emerging at the town of Cherokee, home of the native Americans and very much a tourist trap of a town. We moved beyond that, heading for the motorcycle friendly campsite of Iron Horse, a place I knew was brilliant for bikers having been there before when crossing the US on my GS. 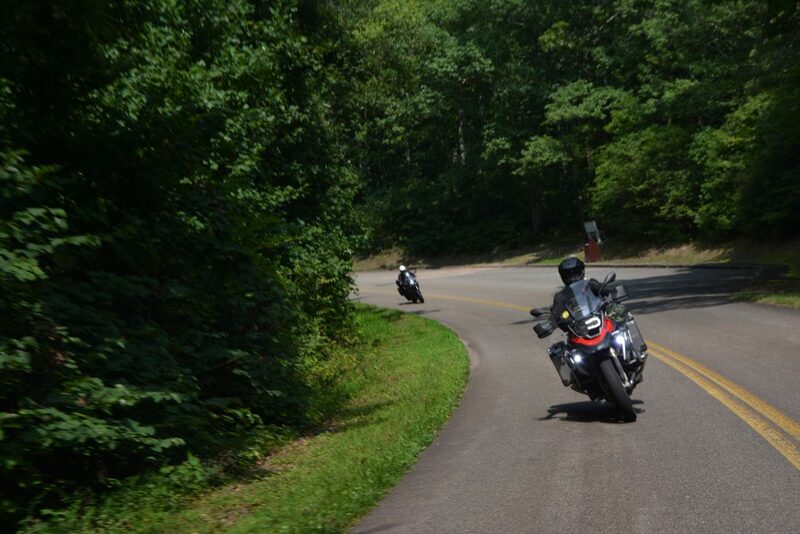 The Iron Horse lodge, not far from the famous Tail of the Dragon, provided a perfect base for exploring the area. It’s a campsite and lodge catering entirely for bikers and is busy with riders exploring the area. Some great riding down there. Dave and Krina caught with us this night. 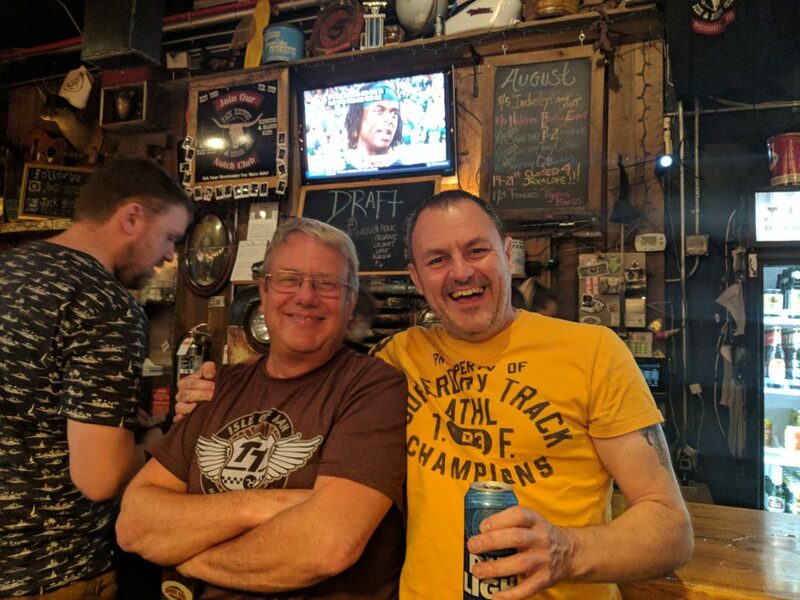 It was a magnificent feat of endurance, the pair hitting the interstate and covering 400 miles that day from Linda and Charlie’s place, which on Dave’s bike and with his level of fatigue a few days prior was something special to have achieved. It was a huge relief to see them, especially as he’d decided to push on with the bike rather than travel by car. Those two together would largely do their own thing from this point on, travelling at the pace Dave’s energy levels would allow him, keeping out of the sun, getting a good night’s sleep in motels rather than camping. It really was a great team effort for that pair. Keefe also turned up that night on a brand new Suzuki V-Strom 650. He’d had enough of his Freewind and flanked off to a nearby dealer and bought himself a brand new bike, leaving the old one at the shop to be worried about at another time. The Garbage Run never had been about a quality of machine, more about the attitude and approach to travel, a bit rough and ready, ridden though the seat of your pants, and so to see a man smiling astride his new steed was all that mattered, even though it did prove a swine to bring home with him in the end. And so we were, five days into the trip, a good 1200 miles covered, now on the edge of the mountains, looking west across the prairies, from here down into Mississippi, Alabama, Arkansas and Texas. In a way the hardest part had been done. We’d got the bikes to America, got them clear of customs, got ourselves clear of New York and were now in full riding swing, Garbage Run USA was well and truly on. Keefe and his Suzuki XF650 Freewind near the start of the trip. 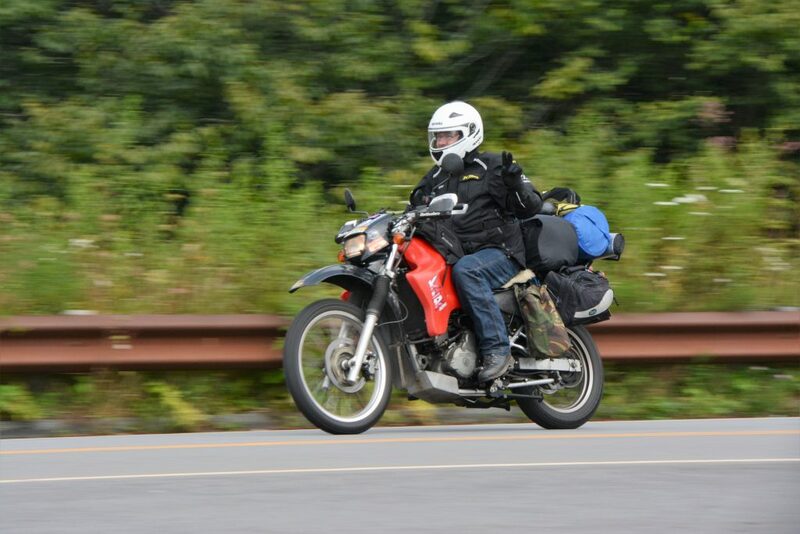 The Freewind didn’t last many days before Keefe replaced it with a brand new Suzuki V-Strom 650 from a dealer in the Appalachian Mountains. 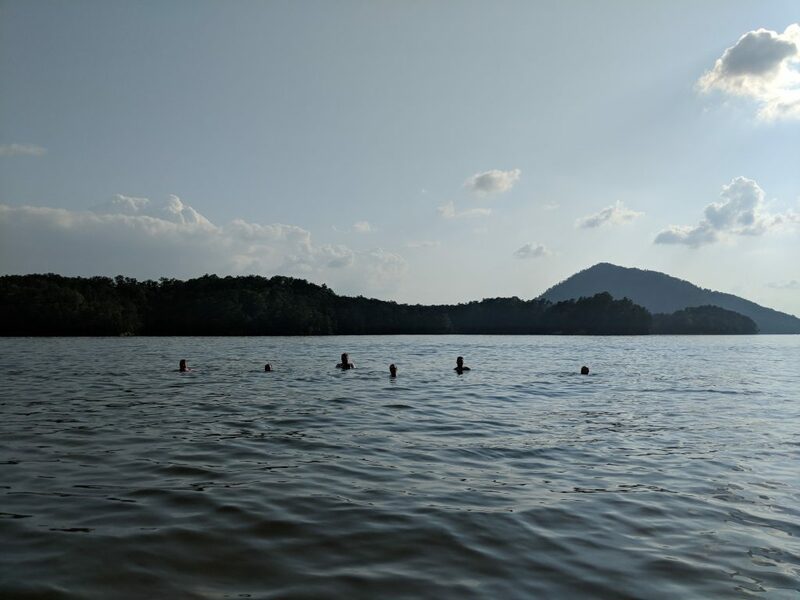 Swimming in the Ocoee River was one of the highlights of this first part of the trip. We’d not made as much ground as originally planned but decided to stop early at a nearby campsite and spend that late afternoon with a swim and a pizza. 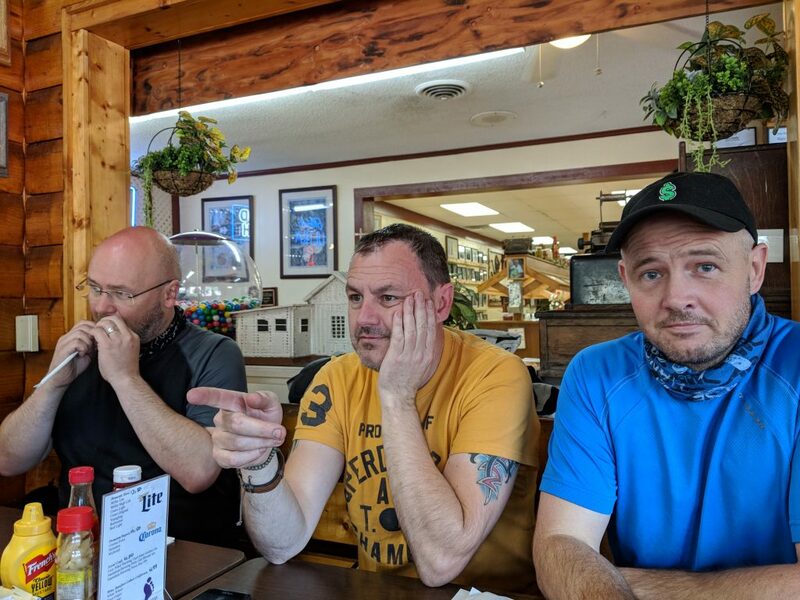 Dave, Garry and Mark at a restaurant at the end of the Blue Ridge Parkway in Cherokee. Burger and fries because a bit of a mainstay, but the food in the States is generally really good. 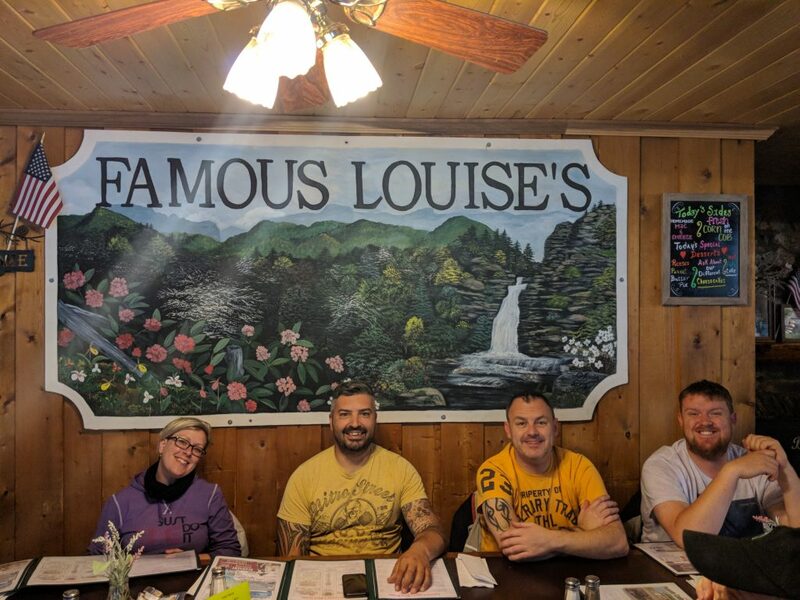 Camping at Winville Falls along the Blue Ridge Parkway led us to eat at the nearby Famous Louise’s where we enjoyed some good home cooked food and a short ride back to the tents at the end. James gives it the thumbs up at Iron Horse Lodge. James had electrical troubles with his bike before the trip began but thankfully it held up with no problems. 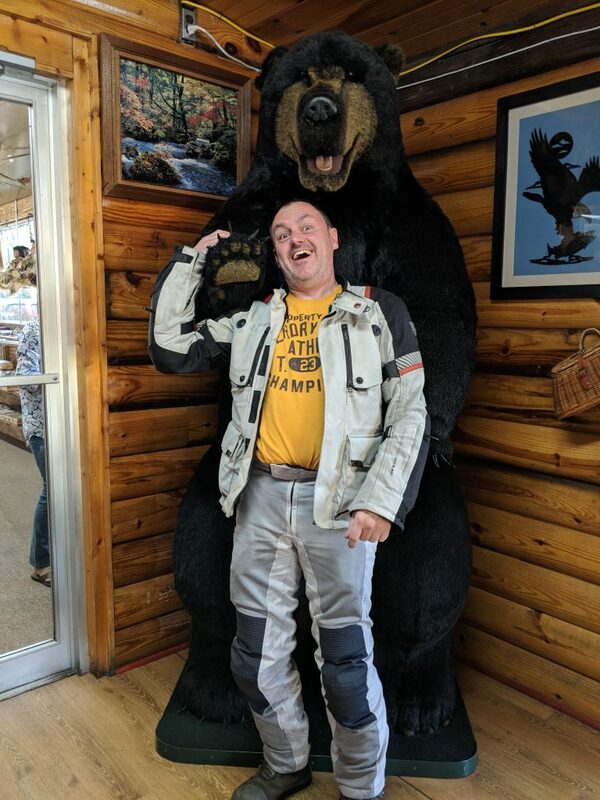 Garry in the clutches of a bear at the diner in Cherokee, the town at the end of the Blue Ridge Parkway. Dave and his Kawasaki KLR650, which kept the ride interesting the first week or so by failing to start and requiring a good deal of pushing. 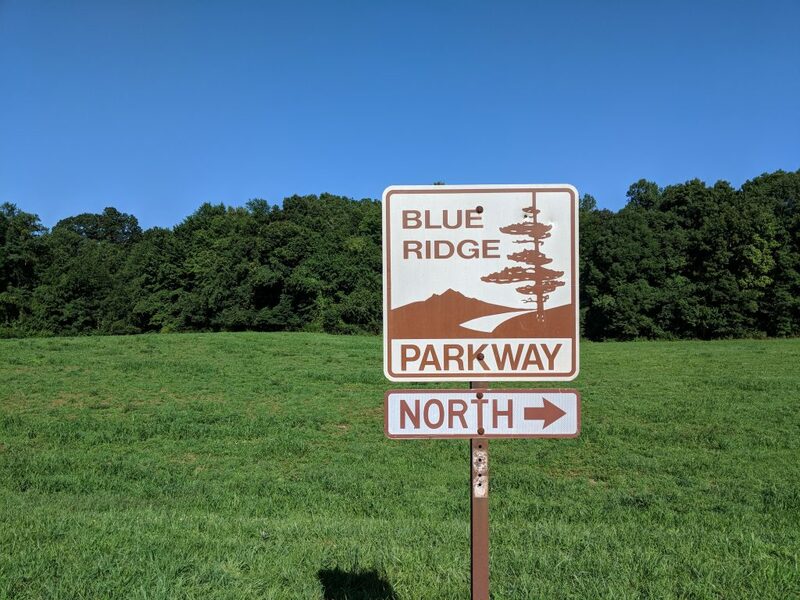 North or South, it’s not easy to get lost on the Blue Ridge Parkway. 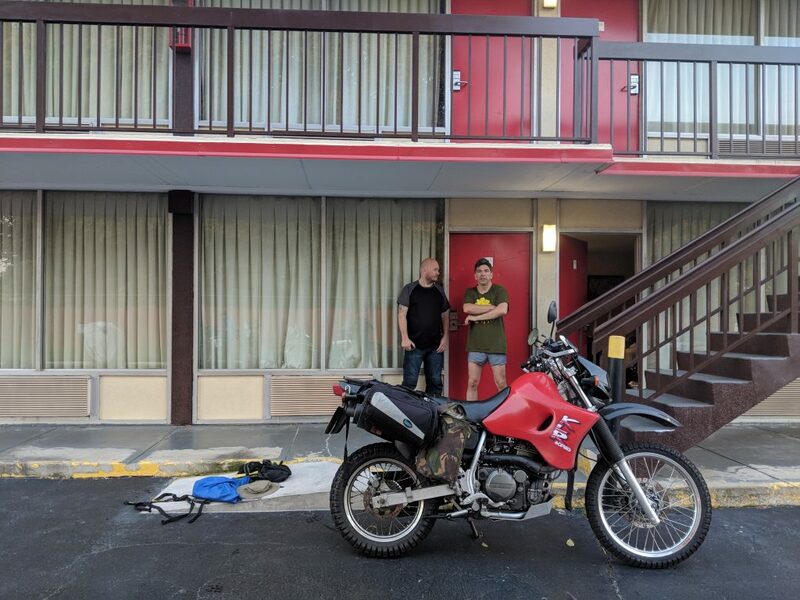 The motel in Roanoke was just the ticket and the city itself really surprising for being a great place to unwind after a long day in the saddle. We’d not planned to stay here, but I’m glad we did. 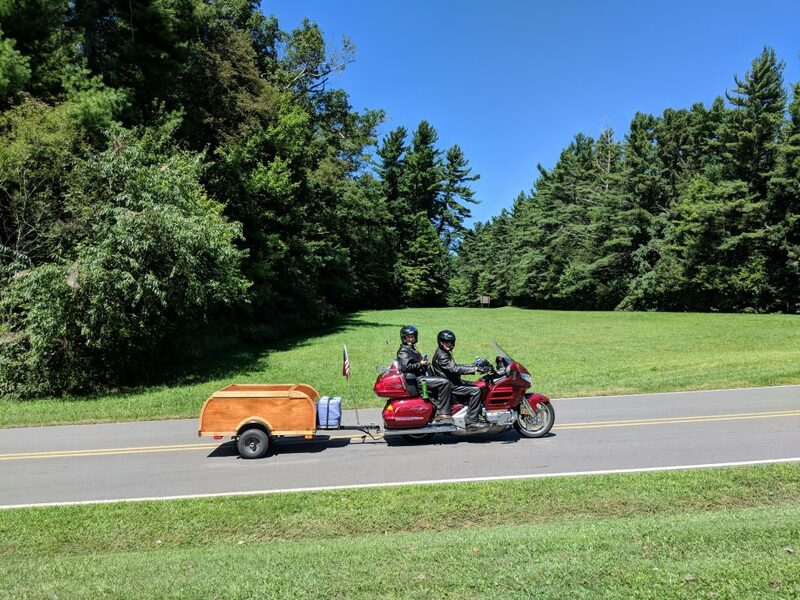 Most of us were over packed, but never to the point of needing a trailer like this pair we spotted on the Blue Ridge. Whatever takes your fancy though. Paul and Garry in the bar in Roanoke, where the beer was home brewed and the burgers magnificent. James sporting his poncho, which soon disintegrated and thankfully the rain stopped anyway. We had a bit more in Texas, but that was about it for the 3 and a half weeks across. 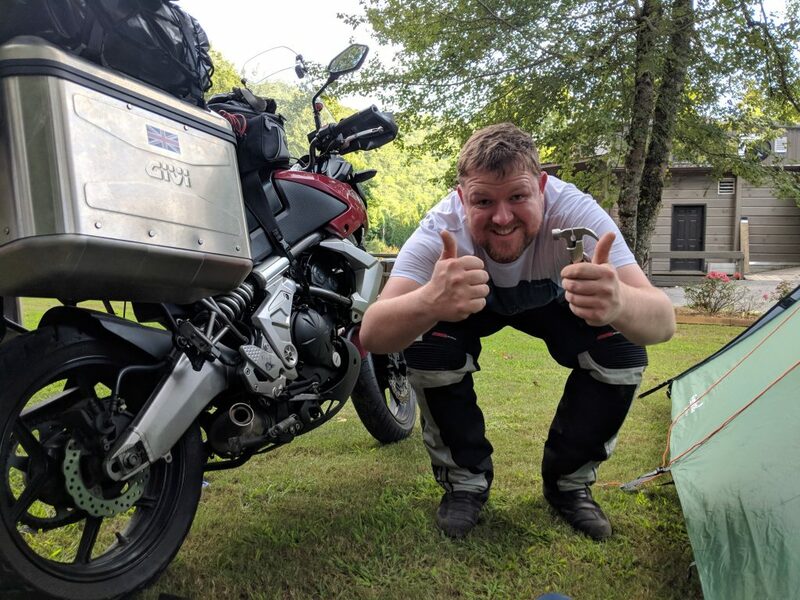 Garry was sensibly loaded on this Yamaha 660 Tenere, that bike about perfect for the mix of open flowing road and slower dirt roads we encountered on the trip. 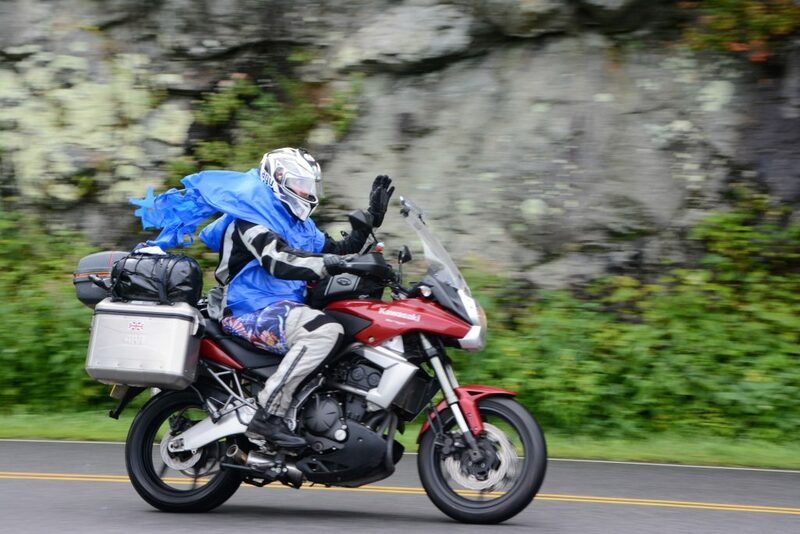 Adrian on his R1200 GS in the mirrors along the Blue Ridge Parkway. 500 miles of corners is about the summary of it. Probably the best bike tour I’ve done. Great riding and better company.